For those that might not remember America's Sweetheart, Doris Day was the biggest box office star at the movies during the 1950 and 1960s. Starring with some of the greats, she appeared in 39 comedies and dramas with the likes of Rock Hudson, Frank Sinatra, Clark Gable, David Niven and James Stewart. But after a stint on TV, she hasn't acted since 1973. Instead, she's devoted her life to her animals where she runs several foundations and the most pet-friendly hotel in the country. Yes, her four-legged furry friends occupy most of Doris Day & Rock Hudsonher waking hours, where she once cared for 30 dogs of her own, while regularly taking in rescue canines and cats. It's a full-time obsession which is exemplified by the hospitality she extends these animals at her hostelry. Taking ownership of the Cypress Inn in 1985 has not been just a business for the retired actress. It's more of a vocation. Nestled in the heart of Carmel-by-the-Sea, California, the iconic Cypress Inn has been a landmark boutique hotel of the Central Coast since 1929. Part of the elite collection of Carmel Boutique Inns, this lodging facility offers a classic boutique luxury inn experience, accompanied by gracious service, ambiance and decor. 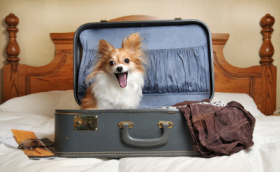 While fully cognizant of the pet friendly services offered at the major hotel chain affiliates like Marriott, it was Ms. Day's decision from day-one to up the game when it came to welcoming pets into her establishment. At check-in, dogs are greeted by name and with a welcome bowl filled with mouth-watering treats. From there, they can join their owners in guest rooms and throughout all of the inn's common areas, including Terry’s Restaurant and Lounge, the European-style courtyard and their cozy living room. Doggie menu items such as burgers and chopped chicken are available upon request -- and “Yappy Hour” in the lounge from 4:30PM until 6PM is a time for all guests and their pets to socialize with each other. In the evening hours at turn-down, the maids will not only leave chocolate on your pillow, but your canines will get a treat left at the corner of their doggie blanket as well. Mutt mitts and a dog wash area are also available and handy after a romp on Carmel’s “leash-free” beach. In town, many dining establishments have pet sections and lists are made available by Ms. Day's staff. *Please register your pet(s) at the time of booking. 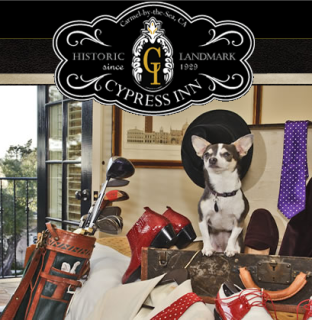 *Cypress Inn does not have weight or breed restrictions for dogs. *A $30 nightly pet fee applies to the first pet, $50 for two and $70 for three. *Pets must not be left alone in the room at any time. *A list of approved pet sitters is available at the front desk for times you cannot be with your pet during your stay. *Pets are not allowed on the furniture in guest rooms or common areas. Pet blankets are provided for use during your stay. *Pets must be on a leash at all times in the common areas of the hotel. *Please walk pets off property and pick up after them to preserve the beauty of our village. *Please take other guests into consideration. If your dog should become disruptive, please remove him/her from the area to allow them to calm themselves. *Cats are also welcome at Cypress Inn! If you should have a more exotic pet, please contact the management to discuss in advance. We will do our best to accommodate all animal friends! Celebrating her 90th birthday this week, Ms. Day has no intent of slowing down. "There is still so much work that needs to be done to rescue animals and to inform people about the importance of spaying and neutering their pets," notes Ms. Day. "I think the most important thing is for people to help the animals who love them," she adds, with that same glint in her eye that made America fall in love with her all those many years ago! Happy Birthday Doris Day from all us and our pets - you are truly an American treasure!